I've not done a haul post for awhile but today I wanted to share with you a few bits I picked up in our local poundland for Blake. They are all things for activities to do with him and at £1 each I thought they were a bargain as he will get so much use out of them. Pom Pom balls are ideal for doing a range of activities with. We did a scooping activity yesterday with them but u can also use them for other activities for fine motor skills and for using in crafts. These skittles are great I picked them up as Blake loves ball games and this would be a fab for him to enjoy and can be used indoors as well as outdoors. This egg and spoon toy set is great for role play. We can pretend to make cakes, use the spoons for stirring, scooping etc. 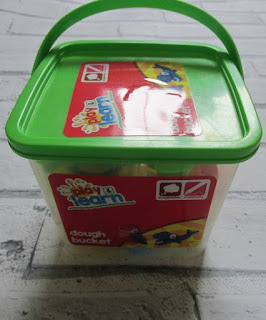 Playdough is something I wanted to get Blake into and both the 4 mini dough pots and dough bucket are a great way to start. We are yet to try them but I think its a great starter set as I don't want to spend a lot on the playdough brand when he may not be that interested in it yet. What do you think of my little haul? Have you picked up any bargains in your local poundland? I love Poundland and always manage to find some awesome items. I was actually in there today. I got Ice cream moulds and a big tub of pavement chalks. I love pom poms and I love Poundland. It sounds like the perfect combination to be honest. Pound Land have got some really fantastic stuff in there at the moment. Not been inside a Pound store in ages. I need to get a few things. Thanks for reminding me. Loving what you got. Oh wow, I never knew pound land did such great things for little ones! They do have some great arts and crafts items instore, we love to get them in too and play over the holidays and in spare time. OMG i love the eggs and spoons so fun, poundland is just awesome. This reminds me that I really need to get to Poundland.